We’re now in the Top 8! 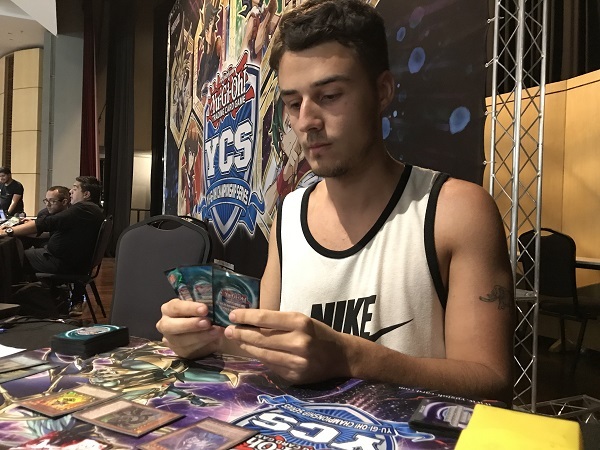 We’re looking at the last Thunder Dragon player in contention, Johan de Castiho Hallack from Juiz de Fora, Minas Gerais who placed 8th after Swiss taking on Caio Santos Barreto who we featured in our Top 32 Feature Match running Windwitch Trickstars. Trickstars have trouble dealing with big monsters and a Thunder Dragon Colossus will stop Trickstar Candina, Trickstar Light Stage and in Barreto’s Deck, Windwitch – Ice Bell. There’s a lot of dead cards to contend with, but it won’t matter if Barreto gets enough burn damage through to end it quickly. Who’s moving onto the Semi-Finals? It’s time to Duel! Barreto won the roll and elected to go first. He activated Terraforming but Hallack negated it with Ash Blossom & Joyous Spring. Barreto Normal Summoned Trickstar Lycoris, Set 2 to the back and passed. Hallack started off with Batteryman Solar. He used its effect to send Thunder Dragonmartix from his Deck to the Graveyard. He then activated Gold Sarcophagus, banishing Thunder Dragonroar from the Deck. He used Roar’s effect but Barreto chained Ash Blossom & Joyous Spring to negate it. He then activated Thunder Dragonhawk to Special Summon the Thunder Dragonmartix in his Graveyard. Solar’s effect activated then Barreto chained Torrential Tribute to destroy all monsters on the field, leaving just the Batteryman Token. 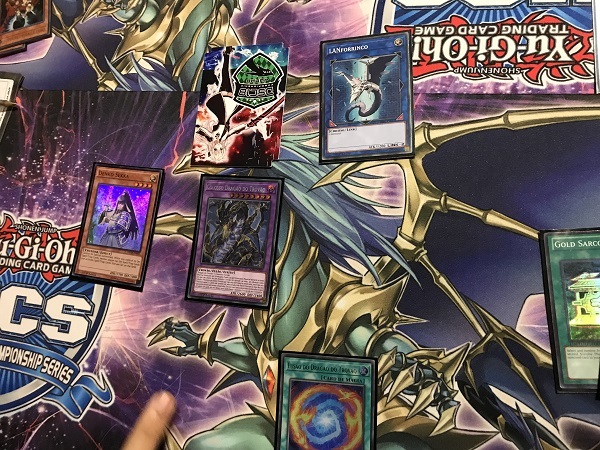 Matrix’s effect let Hallack add another Thunder Dragonmartix from his Deck to his hand. Hallack then activated Thunder Dragon Fusion, sending back Thunder Dragonroar, Thunder Dragonhawk and Thunder Dragonmartix to Fusion Summon Thunder Dragon Titan. Titan attacked directly, leaving Barreto at 4800 LP. In Main Phase 2, Hallack Set Infinite Impermanence and in the End Phase, Barreto activated Scapegoat, Special Summoning 4 Sheep Tokens. 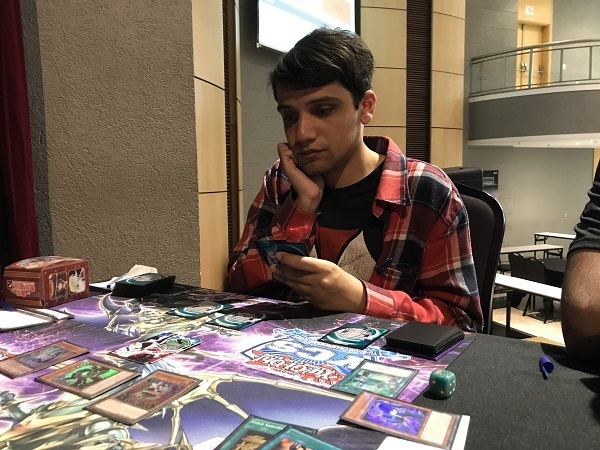 Barreto used one Sheep Token to Link Summon Link Spider. He used another Token to Link Summon Linkuriboh. Then he used Linkuriboh and the third Token to Link Summon Knightmare Cerberus. He then used Linkuriboh’s effect, Tributing the 4th Token to Special Summon Linkuriboh from the Graveyard. 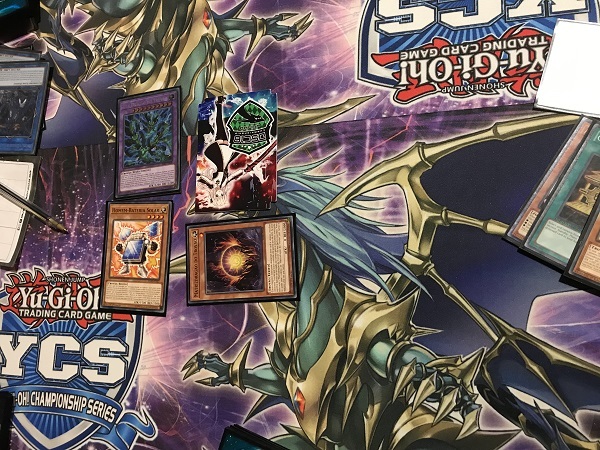 After that Special Summon, Hallack activated the effect of Thunder Dragonmartix in his hand on Thunder Dragon Titan and Titan’s effect was chained, destroying Linkuriboh. Barreto had his Knightmare Cerberus destroy the Batteryman Token in battle. In Main Phase 2, Barreto used Knightmare Cerberus and Link Spider to Link Summon Ningirsu the World Chalice Warrior. He tried to use Ningirsu’s effect but Hallack negated it with Infinite Impermanence. Hallack drew Thunder Dragonhawk and used its effect to Special Summon the Thunder Dragonmartix in the Graveyard and chained Titan’s effect to destroy Barreto’s Ningirsu. Hallack then banished Thunder Dragon Fusion from his Graveyard to add Batteryman Solar from his Deck to his hand which was Normal Summoned. Barreto conceded here, unable to deal with the Thunder Dragon Titan on the field. Barreto elected to go first. he started with Trickstar Light Stage whose effect let him add Trickstar Candina from his Deck to his hand. He Normal Summoned Candina and used its effect to add Trickstar Reincarnation from his Deck to his hand. He used the effect of Trickstar Lycoris in his hand, returning Trickstar Candina to his hand and Special Summoned Trickstar Lycoris. He Set 3 cards to the back and passed. Hallack drew and took 400 damage from Trickstar Lycoris. He Normal Summoned Denko Sekka! All of Barreto’s Set cards were now locked down and can’t be activated! Gold Sarcophagus came down next, banishing Thunder Dragonroar whose effect Special Summoned Thunder Dragondark from the Deck. Next, Hallack activated Mind Control to take control of Barreto’s Trickstar Lycoris. He used Thunder Dragondark and Trickstar Lycoris to Link Summon LANphorhynchus. Thunder Dragondark’s effect let Hallack add Thunder Dragon Fusion from his Deck to his hand, prompting Barreto to activate Droll & Lock Bird from his hand. Hallack activated Thunder Dragonhawk from his hand to Special Summon the banished Thunder Dragonroar, then Hallack activated Thunder Dragon Fusion to Fusion Summon Thunder Dragon Titan and Barreto couldn’t do anything to stop the damage from coming in! Barreto extended the handshake! Johan de Castiho Hallack takes a quick match and moves onto the Semi-Finals!